When the Castle and Salt Box were physically moved from Bunker Hill to Heritage Square in Highland Park, it was probably a sight most residents had never seen. However, this was not the first time a home on the Hill was relocated. Almira Hershey outdid them all in the early 1900s by not only moving her Bunker Hill home, but by also splitting it in half and transforming it into a massive and majestic apartment building. Almira Hershey, better known as Mira, is a name that was once prominent in Los Angeles, but is now pretty much (and unfortunately) forgotten. She was a relative of Milton S. Hershey, founder of the Pennsylvania chocolate empire, and the daughter of Benjamin Hershey who amassed a fortune in the lumber and banking industries. Mira inherited a substantial sum when her father died and she relocated from Muscatine, Iowa to Los Angeles in the 1890s. Hershey purchased real estate on Bunker Hill and commenced construction on a number of residences, including her own home at the NE corner of Fourth and Grand Avenue in 1896. The elegant structure sat across the street from the Rose Residence, and cost $5,000 to build (around $123,000 in today’s dollars). After living at 350 South Grand for ten years, Hershey decided she needed a change. Instead of merely redecorating, she physically had the house moved to 750 W. Fourth Street and commissioned architects C.F. Skilling and Otto H. Neher to split the residence in half and turn it into an apartment building. The renovations on the new building were completed in December of 1907 and the finished product included one and three bedroom suites complete with patented wall beds, artistic wall decorations, and interior wood finishings. Because of the structure’s resemblance to a European castle, Hershey’s new apartment building was christened the Castle Towers. As for the prime lot on the corner of Fourth and Grand, Hershey had plans to build a hotel on the location of her former residence, and again hired Skilling & Neher. The concrete foundation had been laid by March of 1908, but plans were halted a couple of weeks later when the architects filed a lawsuit against Hershey for nonpayment of fees. The hotel was never completed, and the concrete foundation was turned into a parking lot that would remain until the neighborhood was completely redeveloped in the 1960s. Mira Hershey did go on build her hotel called the Hershey Arms on Wilshire Boulevard. She also fell in love with the famed (and former) Hollywood Hotel, which she purchased and lived in until her death in 1930. She was so enamored with the building at the corner of Hollywood and Highland that she commissioned a replica, the Naples Hotel, be constructed in a Long Beach neighborhood. Mira Hershey was always quick to share her wealth, but kept her philanthropic activities private after the Los Angeles Times attacked her for donating money for a hospital to be built in her hometown of Muscatine, Iowa instead of her current home city. One of Hershey’s most significant donations came after she died and her will revealed that she left $300,000 to UCLA for the construction of the school’s first on-campus dormitory. Countless students would call Hershey Hall home for decades. As for the former residence-turned-apartment building, the Castle Towers and its residents lived a peaceful existence and until the mid-1950s when the Community Redevelopment Agency came a callin’. Photo courtesy of the Los Angeles Public Library Photo Collection. Postcard from the personal collection of Christina Rice. By the spring of 1968 only three of the great mansions on Bunker Hill were still standing. The Castle (325 South Bunker Hill Ave) and Salt Box (339 South Bunker Hill Ave) were soon to be moved to their new home, Heritage Square in Highland Park (and subsequently burned down by vandals). The days were definitely numbered for the Victorian beauty at 232 South Grand Avenue and smaller house behind it whose address was 232 ½. The only reason the residences on Grand Avenue stood as long as they did is because the Community Redevelopment Agency (CRA) made the front house the location of their Bunker Hill Relocation Project Office. Once the residents had been removed from the neighborhood and the CRA no longer had a use for the mansion, it too was removed. The mansion at 232 South Grand Avenue and its backyard neighbor at 232 ½ were built in 1894 by Bernard Sens, a German immigrant who came to Los Angeles and set up shop as a tailor on Broadway. He had initially been residing a couple of doors down at 224 S. Grand, but apparently needed a more suitable dwelling for his wife, four sons, and six daughters. He held onto his former residence and began renting out its rooms, and presumably did the same thing with the house at 232 ½.
Sens was a well respected tailor about town and had provided the city’s police force with their uniforms. The business was a family one, with the Sens sons contributing at one point or another. Matriarch Kate and her daughters received mention in the society pages and the Sens were a typical Bunker Hill family of the Victorian era. Bernard passes away in 1903 and his widow and their daughter Emma resided in the mansion until Kate’s death around 1923. Like most of the other neighborhood mansions, in the mid-1920s, 232 S. Grand Ave became a boarding house. Unlike many of the Victorians that were divided into numerous single room residences, the division of the former Sens home provided lodging for only four separate households. Around 1928, Dr. James Green, his wife Elizabeth, their three daughters, and two grandchildren moved in and had enough room for the doctor to also set up his practice. Dr. Green, who had been born in England and spent time in Colorado before moving west, would serve Bunker Hill residents as their physician for nearly thirty years. Dr. Green seemed to have done a fine job taking care of his patients, with the exception of sixty-five year old Theresa Dawson who, while under the doctor’s care, strangled herself with her own bandages at her home down the street. By 1939, the mansion had once again become a single family home with the Greens as its sole tenants. The doctor was paying a whopping $100 a month (around $1,200 in today’s dollars) to live in and run his business out of the ten room mansion. Dr. Green lived and worked on Bunker Hill until his death in 1956. His wife, Elizabeth, continued living on Grand until her death a few years later. Since the house was not inhabited by numerous boarders, it proved to be an ideal place for the CRA to set up its relocation headquarters in 1963. It was here that Bunker Hill residents, some of who had lived in the neighborhood for decades, received their walking papers. When the dirty work was completed in 1968, the houses at 232 and 232 ½ South Grand Avenue went the way of the rest of the grand mansions of Bunker Hill. The next time you take in a show at the Ahmanson Theater or the Mark Taper Forum, take a minute and think about the St Angelo Hotel. For 70 years the impressive Victorian structure dominated the corner of Grand and Temple where the Music Center now stands. From stately hotel to slum boarding house, the St Angelo represented Bunker Hill in all its glory and decline. Unfortunately, Mrs. Smith’s timing was a bit off. When the St. Angelo opened, the booming 80s were winding down and the hotel did not fare as well as planned. In August 1889, the hotel was shut down by the sheriff due to an attachment on the property, but was able to reopen three months later. Mrs. Smith held onto the hotel for twelve years, waiting for prosperous times to return, but ultimately had to give up the property. Prosperity did come to the St Angelo in the early years of the 20th Century and the hotel hosted many parties, weddings and conferences. Guests were frequently mentioned in the society pages. While the patrons of the St. Angelo may have been of a more refined type, the same could not always be said of its employees. For example, there was no love lost between Mr. Cole, the hotel cook, and Mr. Brown another hotel employee, who were known to frequently spar. One day in March of 1902, all hell broke lose and Brown and Cole chased each other around the kitchen throwing, “catsup bottles, dining-room chairs, and other utensils that came handy.” The authorities were summoned and Brown was fined $5. In 1904, Mrs. A.M. Smith came back in the picture when she realized that she legally still retained, as the L.A. Times reported, a strip of land “seven and one half feet, extending from Grand avenue to Bunker Hill avenue and passing directly under the St. Angelo.” The property owners demanded that she hand over the deed to this strip of land, but Mrs. Smith held out for the cash settlement. She finally made a profit on the St. Angelo. No boarding house on Bunker Hill would be complete without a bit of death and mayhem. In 1906, Charles Malan, a Frenchman suffering from consumption and depleted funds, did himself in by sealing off all the doors and cracks of his room and turning on the gas. Then there is the sad story of Frederick Merrill, an 87 year old inventor and resident who slipped on a banana peel on Main Street and died from his injuries a couple of weeks later. Finally, in 1943 a fight broke out in the hotel’s lobby and Mrs. Mae Perry, the hotel manager, broke up the scuffle…with a gun. Rubio Ernesto, 17 and not a hotel guest was killed in the incident. By 1939, when a WPA census was conducted, the St. Angelo and its 57 units were in need of “major repairs.” As the Los Angeles Times noted, “it is an old wooden pile now proudly in decline, a genteel old building still snobbish among the smaller structures around it which were built not much later.” Despite the hotel’s shabby condition, it stood proudly on the Hill until the board of health ordered it vacated in 1956. All traces of the once grand hotel were soon erased and replaced by the Music Center which was dedicated in 1964. For many, the tragedy of Bunker Hill was seeing Victorian structures that had survived more than half a century torn down in the blink of an eye. While many homes did survive for up to eight decades, others like the Crocker Mansion had somewhat abbreviated lives, lasting a mere thirty years or so. The E.P. Bryan residence at 333 S. Grand, however, might possibly win the award for shortest existence of a mansion on Bunker Hill. In 1904, Bryan was developing the Westmoreland Tract in the Wilshire-Pico District and construction commenced on an eighteen room home by architect Charles F Whittlesey, who incorporated his trademark reinforced concrete into the design. It is unknown if Bryan left Bunker Hill because Westmoreland was more fashionable or because he felt the Grand Ave residence to be unlucky after all. By 1906, the Bryan family had moved into their palatial new quarters and the home on Bunker Hill was gone, replaced by the Fleur-de-Lis Apartments and another house. The E.P. Bryan Residence has existed for approximately fourteen years. Perhaps the superstitious homeowner had been onto something. In the ensuing years, many residents of the building that replaced the short lived mansion would suffer severe misfortunes. In 1907, John Harding was half a block away from his Grand Ave lodgings, when he was beaten within an inch of his life in a case of mistaken identity. Another resident, P.J. Sinclair, had been out of work for sometime before he decided to end it all by swallowing poison in 1938. Several days went by before his body was discovered inside the boarding house, along with the suicide note that read "I have not got the nerve or conscience to be a crook and under the present conditions it is better to die than to live." In 1932, Everett R. Todd thought jumping out the window of his room a preferable way to end it all. His reasons according to the letter he left behind were "the suffering I am causing so many people and because of nervousness." Then there was C.L. Devont, who was despondent over a failed marriage in 1934 when she shot herself in the heart . At least she was thoughtful enough to write a farewell note, leaving all her possessions to her estranged husband. It wasn’t all gloom and doom at the Fleur-de-Lis Apartments, later known as the Capitol Hotel. 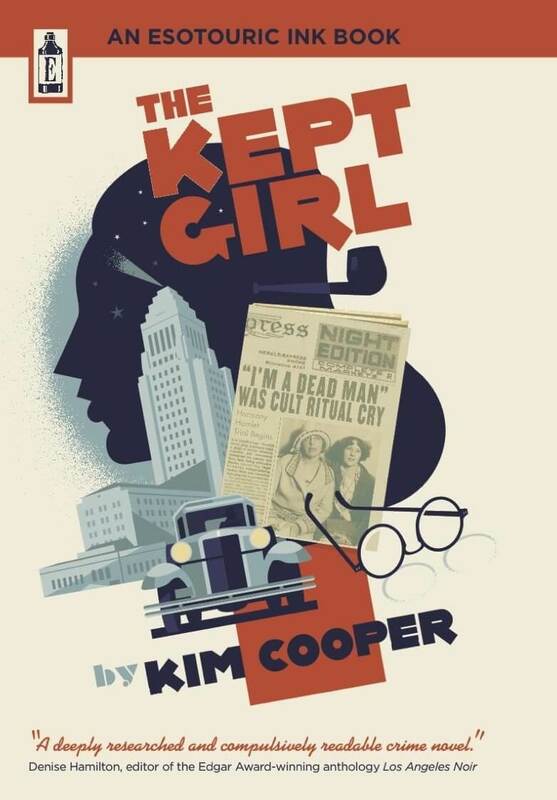 In 1937, residents were involved in a 1,200 person written protest, objecting to the City Council’s proposal to replace Angels Flight with an elevator. The building also held the distinguished honor of housing Los Angeles’ shortest man, Angelo Rossitto, who was two feet eleven inches tall. By 1962, "progress" had come to Bunker Hill and the Capitol Hotel went the way of its Victorian predecessor. The demise of Bunker Hill conjures up image of bull dozers doing the bidding of the Community Redevelopment Agency, leveling the landscape of the once colorful and picturesque neighborhood. While the CRA’s master plan dealt the final blow to Bunker Hill, the demolition of victorian structures in the area had been taking place for decades. The Brunson Mansion at the corner of Fourth Street and Grand Avenue was an imposing structure that seemed destined to stand indefinitely. Instead it would last less than four decades and become an early victim of the City’s obsession with the automobile. The residence known as the Brunson Mansion was built in the early 1880s by Judge Anson Brunson who resided on the bench of the Los Angeles County Superior Court before stepping down to serve as a lawyer for the lucrative Santa Fe Rail Road. According to the L.A. Times, the residence was “a dark red house, large, compact, dignified, in the center of sloping lawns walled up above the level of three streets.” The house was so large it had a Bunker Hill Avenue and a Grand Avenue address, before settling on 347 South Grand as its official label. One of the mansion’s next owners was Dr. B.F. Church, who with his wife, used part of the house as their residence where numerous social gatherings were held. The doctor converted the other part of the house into the short-lived Los Angeles Eye, Ear & Throat Hospital aka The Eye and Ear Infirmary until 1901. Eighteen years later, B.F. Church, who had suffered years of mental problems, would throw himself out of an office window at 7th and Grand, plummeting to his death in front of a lunchtime crowd. In the early years of the new Century, the 18 room property became the Hotel Brunson. Its thirteen years as a boarding house would see little incident other than almost getting burned down by a wayward firecracker in 1904, and the shooting of a burglar by a hotel resident in 1909 (the police followed the trail of blood and apprehended the suspect at his nearby home). By 1917, the automobile had come to Bunker Hill and the owners of the property at 347 South Grand decided that a two story brick garage would be more lucrative than a hotel. In April of that year, the furnishings of the Brunson Hotel were auctioned off, and stately structure which was once a “show place of the city” was demolished and replaced by an auto mechanic. Old Bunker Hill can evoke images of Victorian grander and prosperity, as well as faded glory and great loss. While many associate the history of Bunker Hill with the buildings that once decorated the landscape, the riches to rags stories of the neighborhood also belong to many of its inhabitants. 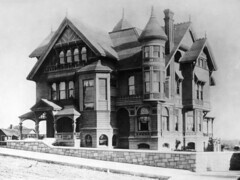 The Rose Mansion at Fourth Street and Grand Avenue was once one of the most picturesque homes on the Hill and its builder and namesake a highly regarded pioneer of Los Angeles County. Despite a celebrated beginning, the house would be demolished long before the Community Redevelopment Agency (CRA) razed the neighborhood, and its original owner would meet his end in a most macabre manner. Leonard John Rose (L.J. ), was a native of Bavaria who immigrated to New Orleans when he was twelve. He received an education in Illinois and engaged in early business ventures in Iowa before organizing a party, including his wife Amanda and two children, to travel to California in 1857. After crossing the Colorado River, the group was attacked by a Native American tribe, incurring losses of life and supplies. Rose and his family survived and temporarily settled in New Mexico. The family made it to California in 1860 and established themselves in the San Gabriel Valley. Sunny Slope was the name of the renowned ranch Rose acquired shortly after arriving in Southern California. Located in what is now the eastern end of Pasadena, the 1,900 acre property contained countess lemon, orange and olive trees, but became famous for its vineyards. Vines were imported from Spain, Italy and Peru, and the wine and brandy generated from Sunny Slope made L.J. Rose a household name and a very wealthy man. He also found success as a breeder with a horse ranch named Rosemead (where the city of the same name now stands), and eventually became a State Senator. In 1887, the somewhat secluded neighborhood of Bunker Hill attracted Rose, and he purchased land at the corner of Fourth and Grand (then called Charity) to build a palatial home for his family that now included nine children. Construction on the house was such a massive undertaking that a scathing editorial appeared in the Los Angeles Times criticizing the builders for piling up so much lumber in the streets that carriages could not pass through. Designed by architects Curlett & Eissen at a cost of around $50,000 and completed in 1888, the Rose Mansion was a gleaming gem among the jewels of Bunker Hill. The L.A. Times ran a piece dedicated solely to the stained glass widows, designed by Rose’s son Guy, who would become a respected Impressionist painter. The Los Angeles Evening Express was so impressed with the stately structure that an extensive article appeared in 1890 describing the interior whose “first and second floors are finished in hard woods and the third in white cedar.” The dining room had a “heavily paneled ceiling” and a bay window with an “elaborately carved arch of oak supported by dragons.” A “heavily carved giant staircase” ran through the house and frescoes by [Attilio] Moretti of San Francisco adorned the ceilings. The home also included a plush library and music room, but the most talked about part of the house was the wine cellar where Rose stored an impressive selection of wines and spirits. On the outside, the most distinct feature of the property was the granite retaining wall surrounding the house with polished steps leading up to the entry. Despite his tremendous success, by 1899 bad investments had left Rose deeply in debt with properties so heavily mortgaged that selling them would have been fruitless. On May 17, a despondent Rose told his wife he was going to Ventura on business and would be returning the next day. Instead, he returned to Los Angeles that night and drafted a suicide note addressed to the his wife at the Mansion, and mailed it. At 10 o’clock the next morning, Mrs. Rose received the letter with Rose stating financial ruin as the reason for taking his own life. He continued the letter by bidding an affectionate farewell to his family. Also included was a postscript stating that his body could be found in the backyard of the Mansion. Family present at the time “were too overwhelmed with apprehension to go to the yard to see whether his dead body was really there.” Mrs. Rose’s son-in-law was summoned from his office Downtown and upon arrival found “his father-in-law lying face downward in a little hollow at the rear of the lot. His head reclined on his hat, and in one hand was clasped a bunch of carnations.” Miraculously, Rose was still alive and was taken to a hospital where his stomach was pumped to remove the 65 morphine pills he had swallowed. Despite the efforts to save his life, too much of the drug had been absorbed into his system and Leonard John Rose died at the age of 72. The official cause of death was morphine poisoning. L.J. Rose was heavily eulogized by the county he had called home for nearly 40 years and the “courageous pioneer” was laid to rest in Evergreen Cemetery. In the meantime, his wife Amanda was left with a ruined empire and the Mansion was soon lost to foreclosure. After a mere 11 years, the Roses no longer reigned over the house at Fourth and Grand. The Rose Mansion was briefly occupied by real estate investor Albert W. McCready. In 1903 the residence was purchased by Colonel Albert B. Hotchkiss, creator and editor of the local publication Public Economy, with his wife Mary. Mrs. Hotchkiss , one of the few women in early Los Angeles to make a name for herself in real estate. A colorful character, Mary Hotchkiss at one time owned a large chunk of Main Street and was once accused of abducting a neighbor’s parrot named “Dude.” Colonel Hotchkiss died of natural causes inside the mansion and Mary wasted no time in landing husband #3, Dr. J.T. Jauch. The Jauches resided at the former Rose Mansion until 1928, when they took up permanent residence at the Fremont Hotel on Fourth and Olive, which Mary owned. The building appears to have remained vacant and in 1935 the State Emergency Relief Administration (SERA) proposed using the residence to house transients. The Health Commission turned this idea down. By 1937 the Rose Mansion was supposedly in such disrepair that it was no longer inhabitable. In the biography L.J. Rose of Sunny Slope, the pioneer’s son claims that the heavy wood paneling was salvaged by 20th Century Fox and used to decorate sets on the Alice Faye/Tyrone Power feature In Old Chicago. When the CRA began its invasion of Bunker Hill in the 1950s, all that remained was the garage and the ghosts of the Rose Mansion and its owners.